Races DIRT Modifieds at the Fulton Speedway. I race Dirt Sportsman Modifieds at the Fulton Speedway in Fulton, NY. I have been doing this for 6 years and have been attending races at the Fulton Speedway since I was less than a year old. Racing is in my blood, its not a hobby for me, but instead a way of life. I wouldn't be where I am today if it wasn't for racing. It kept me in positive spirits when I was a young teenager battling cancer and I also feel it is the reason I have the drive to succeed on and off the track. Katelyn Kane Racing is not your average race team, frankly, because Katelyn has not had the average life. At the age of 13 Katelyn was diagnosed with Leukemia. 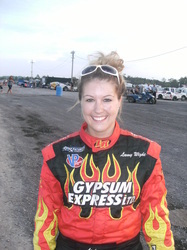 After a 2 1/2 year battle with that, Katelyn was determined to battle adversity and live her dream by driving a Sportsman Modified at the Fulton Speedway. Since hopping in that car in 2007, Katelyn has not looked back and continues to prove to the world both on and off the track that with a little determination anything can be achieved. I am sure any racer will tell you racing is not a hobby, it is a way of life. I cannot imagine where I would be right now if it was not for racing. My familys involvement in racing began before I can remember. I am sure when my grandfather found out he had two granddaughters did not anticipate owning a racing team forever. Being a car owner for a prominent DIRT Modified driver, Mitch Gibbs, my grandfather had the whole family involved in maintaining and transporting the car to races up and down the east coast. However, in the early 2000s he decided that it was time to sell off the equipment and focus on family as his two granddaughters were getting older. Little did he know that he would have to start up a new racing team just a few short years later. I can remember being left home some race nights when my grandfather owned the cars. I would stand at the door crying to my parents to take me with them. After my grandfather sold the equipment, he was able to take me to the tracks more, and as spectators we would attend three or more shows a week. I can remember dancing around in all my oversized racing t-shirts (as no team bought the kids sizes) proclaiming someday I would race with these drivers. However, in January 2005 that dream of mine took a backseat. I was diagnosed with Leukemia. Two and a half years of back and forth and in and out of hospital rooms, emergency rooms, and the operating rooms ensued. However, I never gave up looking forward to my dream. I would plead with the hospital staff to let me leave for a few hours on Friday and Saturday nights so I could relax and enjoy some dirt racing action at both the Brewerton and Fulton Speedways. Upon finishing my chemotherapy, my family and I celebrated my 16th birthday, and I was preparing to strap myself into a DIRT Sportsman Modified. Since that initial race in May 2007, I have continued to grow as a driver and a person. I have used my story as an inspiration to all who come to know me. Not only are my family and I involved in dirt track racing, but since my diagnosis we have become active members in giving back to the community. It was after being diagnosed with cancer that I truly saw the impact of such services within my community when I myself had to use some of the charities around the area. Upon becoming healthy enough, I immediately started participating any way I could to give back. I lent my face and story to posters for annual fund raisers so participants could see a face to this awful disease called cancer including the 2005 St. Baldricks poster in Syracuse, NY and the 2005 Paiges Butterfly Run Poster in Syracuse, NY. I also participated in The Light the Night Walk in Syracuse, NY that the Leukemia Lymphoma Society hosts annually. I even was able to share the event with my high school tennis team who surprised me by raising over $1000 in just one week in honor of me. As I became even healthier, I started to go back to my normal life, but I never forgot who helped me along the way. As a result I continued to provide service to the community, even donating a summer to volunteering at a local hospital. I donated racing items to an annual Make-a-Wish auction in Oswego, NY as well as collecting donations at Fulton racetrack for the Galisano Childrens Hospital in Syracuse, NY. I also became a guest speaker for the Leukemia Lymphoma Society speaking on behalf of the Leukemia Lymphoma Society at Cicero-North Syracuse High School after the principals daughter lost her battle with Leukemia. I have appeared in their yearly flyer, as well as implementing fundraisers in my own high school which raised over $3000 in two years which again was donated to the Leukemia Lymphoma Society. This year I have been approached by a fellow racer to be a part of a racing fundraiser at the Can-Am Motorsports Park in LaFargeville, NY to further benefit the Galisoano Childrens Hospital in Syracuse, NY. Although I never reaped the benefits of the Childrens Hospital during my years of illness, I was able to watch the progress as it was built and still hear of the amazing benefits new families have while enduring such a terrible time in their lives. I have also spoke to girl scouts about breaking down barriers as well as bullying as well as participated in reading programs with school districts around central New York. Just when I thought my life was busy enough between racing and community service, I also am a full time student at Le Moyne College in Syracuse, NY. I am a Mathematics major, concentrating in actuary science, and an Economics major with an Accounting minor and a Business Administration minor. Through all my trials as well as my busy schedule, I am still able to remain a straight-A student as I have always been in grade school. I currently have a GPA of 3.934 and have received Deans List Honors every semester thus far as well as the William R. Lukacs Medal in Mathematics and the T. Frank Dolan Jr. Medal in Freshman Liberal Arts.I am also a member of Alpha Sigma Nu (The Jesuit Honors Society)and Omicron Delta Epsilon (The Economics Honors Society). I believe that everything one pursues in life has to be given 100% effort and so far I feel that I have done just that. The Mothers Day weekend treat at the Fulton Speedway was a huge success for the second year in a row. The now annual Girl Scout night gave many local Girl Scouts their first taste of dirt car racing. The girls came out in crowds this weekend as soon troops got to sing the national anthem while others raised money by face painting. The girls not only get to watch the races that evening, but also get to meet drivers and see their cars up close as well as take many pictures of the entire night.